There is one fundamental difference in cruciate injuries between dogs and people; in humans this is normally a traumatic injury (a bad fall while skiing, or a hard tackle in football), while in dogs it is actually a chronic degeneration of the ligament. We don’t really know why this occurs, and is probably due to a combination of factors including some genetic aspects. It does tend to be seen more commonly in certain breeds – Labradors, Rottweilers, and Boxers for example. Because cruciate rupture in dogs occurs due to a gradual weakening of the ligament, we can’t repair it surgically, or expect it to heal. The degeneration would continue and the ligament would basically fail again. Therefore, a lot of treatments for this condition in the past focused on trying to replace the ligament with another structure – either a tissue graft taken from within the leg, or an artificial material such as surgical nylon placed around the joint. While patients do improve after these kinds of treatments, they take a long time to begin using the leg to any degree, they do not return to using the leg normally, and arthritis progresses within the joint over time. 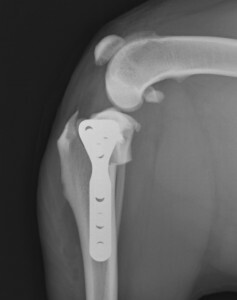 More recently, a different approach has been taken to treating canine cruciate ruptures, with good results. Instead of trying to replace or mimic the function of the cruciate ligament, we can alter the way the muscles act around the knee so that they do not need a cruciate ligament anymore. Knee Surgery Acronyms – TPLO and TTA. In both cases a portion of the tibia bone is cut and shifted just a few millimeters, which slightly changes the direction that the quadriceps (the strongest muscles of the thigh) are pulling on the knee. 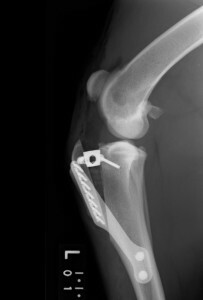 The abnormal movement that occurs in a knee with a ruptured cruciate ligament is no longer present, and the joint is now stable for the dog to walk and run. There is no difference in outcome between the two procedures, and the decision about which is best for a certain patient usually depends on the specific shape of the knee. Whenever you make a cut in any bone it has to be held in place while it heals over about 6 weeks. 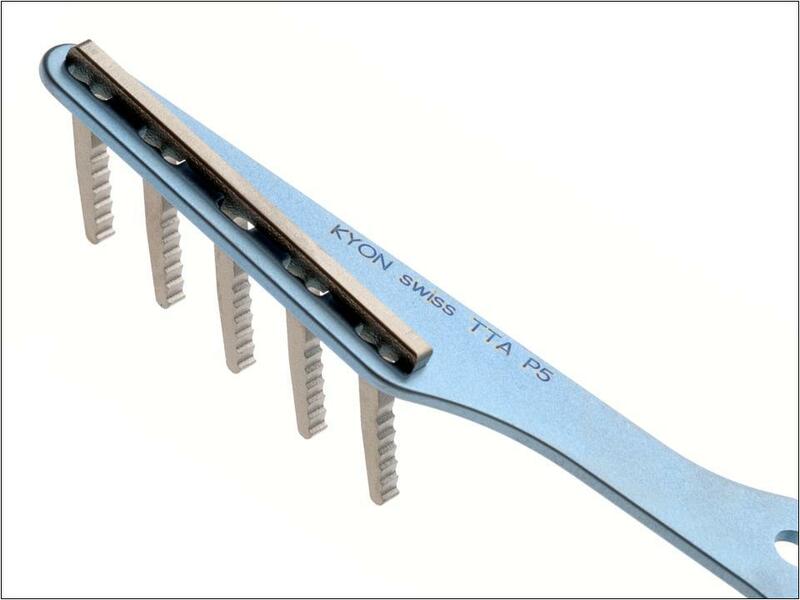 Special plates are used with TTA and TPLO to fix the bone securely, though it is still very important to keep the patient as quiet and rested as possible during that 6 week period to achieve correct healing. Despite being a big surgery, dogs that have a TPLO or TTA performed are usually walking very comfortably on the operated leg 24 or 48 hours after surgery, which is much sooner than we usually see with the older techniques. They also go on to use the leg more normally long-term, and can in most cases return to the same level of exercise ability they enjoyed before the injury. Additionally there is significantly less arthritis that forms in the knee as they get older. These surgeries have revolutionized our ability to treat CCL rupture in dogs, and make us much more successful in getting them back to normal athletic activity. Our surgeons have been performing TPLO and TTA for several years now, and it is not unusual for four or five to be operated in our hospital in one day. They are very involved procedures however, requiring a lot of specialized equipment and carry a risk of serious complications if not performed by experienced surgeons. We are very pleased to be able to offer both TPLO and TTA, and love the new lease on life it gives to some of our most active patients.